Card Text Play: Choose a house. 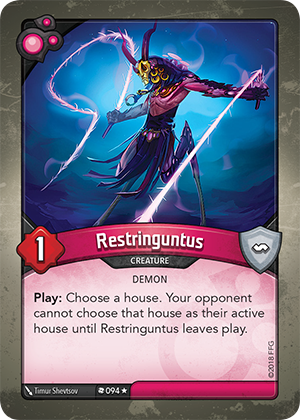 Your opponent cannot choose that house as their active house until Restringuntus leaves play. What if my opponent plays a Collar of Subordination on my Restringuntus, does its effect now apply to me? No. Restringuntus has a “Play:” ability which is completely resolved when Restringuntus enters play, by creating a lasting effect on the opposing player. This effect does not change if Restringuntus changes control and it only ends when Restringuntus leaves play.